When legislative policies or human behaviors threaten the welfare of wildlife in the Bay Area, WildCare takes a stand — and helps you do so, too. Join us in speaking out for positive change for the environment and the world we share with wildlife. Learn about WildCare’s work to combat the use of rat poisons! Our extensive testing of predatory wildlife since 2006 has helped entities from the California Department of Pesticide Regulation to the United States Environmental Protection Agency prove the risks to hawks, owls, foxes, raccoons and other rodent-eating wildlife from these deadly toxins. 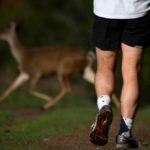 A vocal group in the small community of Belvedere, California is calling for the sterilization of does (female deer) in a herd that is frequently seen by residents. Reaction to the deer is mixed, as is the question of whether there are too many deer in the area. WildCare has significant concerns about the safety and efficacy of the proposed sterilization methods. Every year WildCare accepts hundreds of animal patients that have been tangled in fishing line, fishing hooks or other manmade plastics. 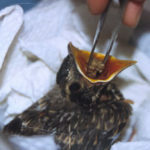 The injuries sustained by tangled animals are both terrible and preventable. Click to learn more about our fishing line recycling program!